You say haroset, I say charosis. Haroset, charosis, haroset, charosis let’s just sit and eat. No matter how you spell it, charosis is a Passover staple on every Seder plate around the world. It’s tart, it’s sweet, it’s delicious. I love the thought of Jews everywhere sitting down to Seder tonight and tomorrow. 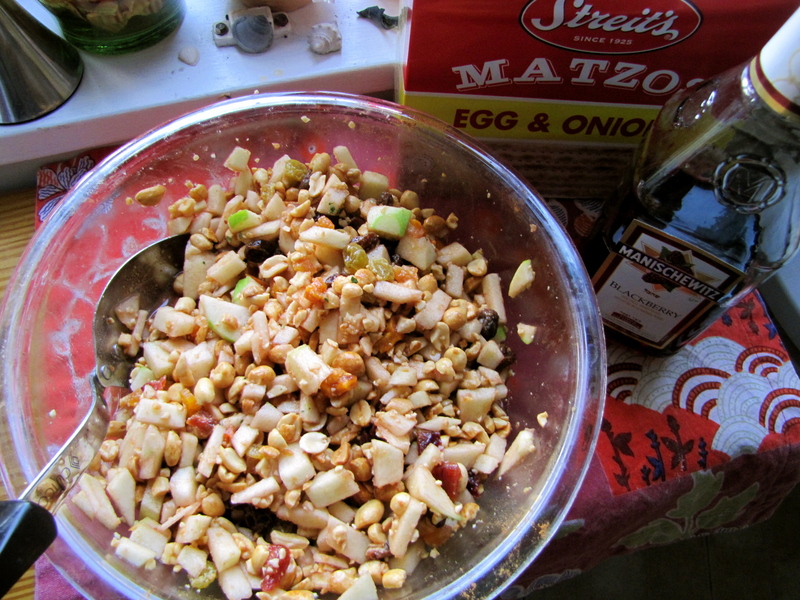 Back to the charosis: this is my mom’s recipe that she has been making every year for Passover. I think this is one of the first years she has not hosted Passover at her house. I live in D.C., one of my brother’s live in Pittsburgh and another lives in Chapel Hill, but is knee deep in law school finals. However, despite being apart, the tradition lives on with this charosis. Note: prepare the night before serving! stir occasionally through the evening & next day. 3. Taste/ask “does it need a bit more cinnamon? How is the ratio of nuts to dried fruit to fresh fruit? Due to my complete lack of time, and my grandma messing up the day that our sedar was I didn’t have a chance to make this. Your picture looks great, and I hope to make it next year!!!! !